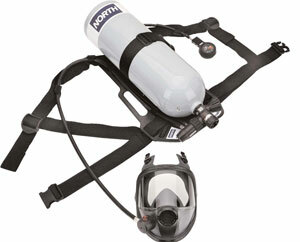 North Safety Products Model 832 SCBA is a low cost and worry free unit, designed specifically for use in non-fire emergency situations, for egress from a contaminated area, or for clean up of chemical/toxic spills and accidents. It is easy to use, easy to maintain and extremely durable. Utilizes the North soft silicone Full Facepiece design with dual sealing flange, oral/nasal cup and polycarbonate lens with greater than 200° field of vision. Reducer/Regulator has only three moving parts, a "fail-open" design and protected housing. Automatic positive pressure demand with only three moving parts and "fail-open" design. Comfortable and adjustable polypropylene harness system and ergonomically designed aluminum backplate. 30 minute rated low pressure (2216 psi) Aluminum Cylinder, with 45 Cu. Ft. capacity. Gives the user unsurpassed protection and ensures greater worker acceptance. Common facepiece design to the 7600 Series air-purifying respirator reduces fit testing costs and user training. Substantially reduces repair costs, possible malfunction and assures user of a supply of air as long as there is air in the cylinder. Eliminates the error of using SCBA in a demand mode, reduces possibility of malfunction and assures user of a supply of air as long as there is air in the cylinder. Provides user comfort and ease of adjustment. Lightweight design distributes weight over a large area for added comfort. Approved for entry and escape from IDLH atmospheres. Positioned in an easy to read position. Positioned for ease of use. Rugged and dependable. The Model 832 SCBA comes with a full year, no-hassle warranty on parts and service.